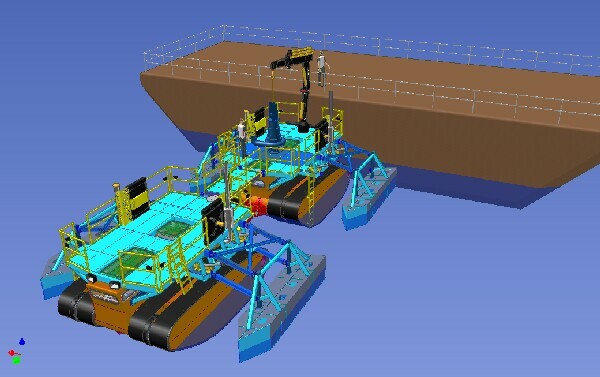 ARKTOS Builds New Amphibious Crane Craft - Arktos Developments Ltd.
ARKTOS Developments Ltd. has been awarded a contract from SUNCOR ENERGY INC. to build an ARKTOS MultiTask-50 Amphibious Crane Craft for operation in SUNCOR’s oil sands settling ponds in Fort McMurray, Alberta, Canada. The principle use of the Craft will be to carry out lifts in and around the ponds using a Craft mounted HIAB Knuckle-boom Crane. The Craft will be capable of waterborne lifts in excess of 4 tonnes.